Based in Vienna, Typejockeys are three young designers — Anna Fahrmaier, Thomas Gabriel und Michael Hochleitner — with a broad palette of activities. They make graphic design for print and web, and have their own digital-to-letterpress project. They are also a typefoundry, to which both Gabriel (KABK, The Hague graduate) and Hochleitner (University of Reading graduate) contribute. With everything that’s going on besides type design, they aren’t Europe most productive foundry, but when they bring out a new typeface, it is always something of an event. Typejockeys’ fonts are not only beautifully made, they also have content — they are carriers of a typographical culture. Their 2012 Henriette is a case in point. ​​Michael Hochleitner’s versatile family is a functional typeface of striking features that betray the design’s origin in early 20th-century lettering styles — more specifically, in Vienna’s street name signs. I like it when designers do serious research regarding their source material (as opposed to quickly scanning a specimen they like and begin fontifying); and here, thorough research took place indeed. The story of the Viennese street sign alphabet and its many incarnations is told (in English) on the Typejockeys website; no use repeating it here. The main outcome of it was that, as there had been so many variations on the (anonymous) early alphabet, done by so many companies for various production techniques, Hochleitner felt free to improvise, no strings attached. The original alphabet came in two distinct versions, for short and long street names — the one a kind of Heavy or ExtraBold, the other Bold Condensed. Developing a family with a broad range of widths, as Hochleitner did, is tricky: it’s like deriving a text family from Cooper Black. The resulting lighter weights are quite interesting, in that they don’t resemble much of what’s already there (Bookman and Candida come to mind) while still building a plausible and usable toolkit for day-to-day typographic work. If you’re looking for something neutral, the typeface’s idiosyncratic feel is a drawback; but for those designers who are looking for a strong and unusual personality, Henriette may be a terrific find. Needless to say, the character set and language coverage are flawless. With thanks to Florian Hardwig. Jan Middendorp is a type writer and page maker. He is author of several books about graphic design and typography including Shaping Text , Hand to Type, Lettered, Creative Characters and (with Erik Spiekermann) Made with FontFont. In 2018 he self-published a reprint of his succesful and sought-after 2004 book Dutch Type, which is now available again at the original price. The black makes a good alternative for Cooper Black. The cap S for example, looks like a Cooper S minus one serif, and that’s probably a good thing. The roman has a distant Souvenir resonance to it. The italic proves how useful a set of swash cappies can be and may point the way as a standard feature of display fonts in the future. For type makers that’s more work, since we will have to draw accented swash caps as well, but potentially doubles the fun of settings in italic and by extension should increase unit sales. Like Hochleitner’s Ingeborg, Henriette is a design so full of character at first glance that most folks will place it firmly in the category of display type, overlooking it as a text option. 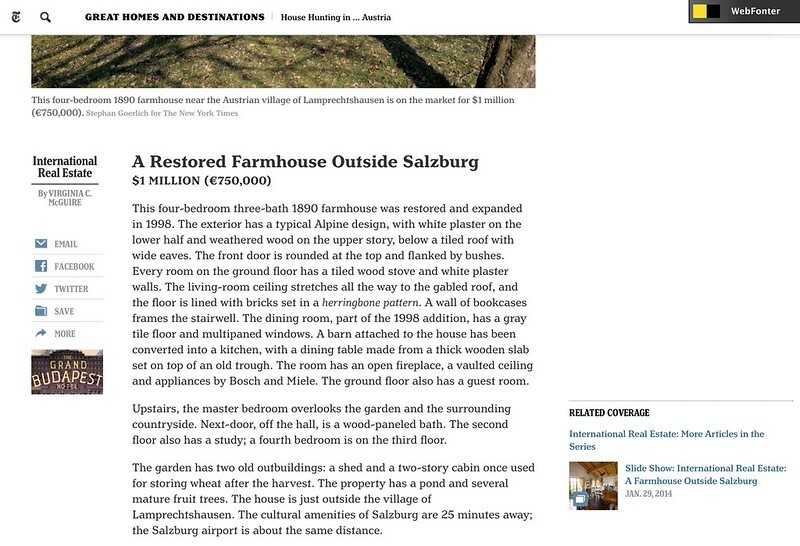 But it sets quite sober, readable text — a fact I just stumbled on today while using WebFonter to hack nytimes.com. The only thing that makes me shy away is that the italics are noticeably lighter in color than its roman companions. This may not bother others, but I like my italics to be the same general weight or the emphasis is too stark. Still, what a lovely page this makes! I wonder if someone deriving a typeface from Cooper Black would even end up with something close to Cooper Old Style.